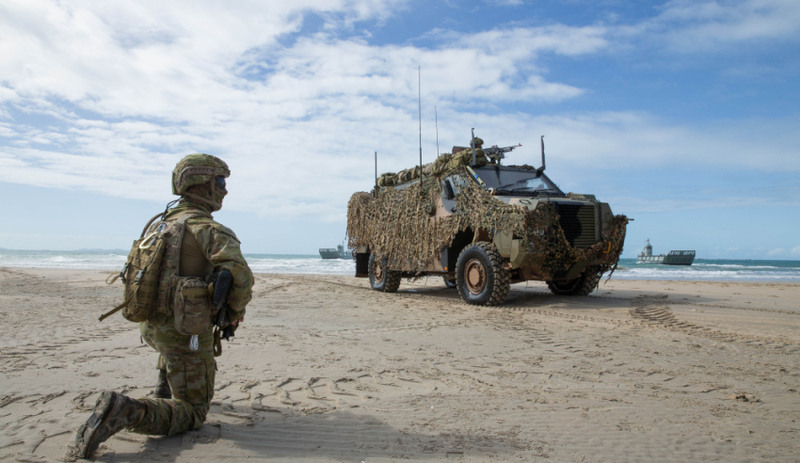 A soldier from 2nd Battalion, Royal Australian Regiment watches an Australian Bushmaster Protected Mobility Vehicle cross the beach in front of him after landing on the beach as part of a major amphibious landing operation during Exercise Talisman Saber. Image via Commonwealth of Australia, Department of Defence. The latest Stockholm International Peace Research Institute (SIPRI) report looking at trends in international arms transfers has seen Australia move up to 19th place among the top 25 largest exporters of major arms. The report, which looks at major arms exports from 67 countries between 2013 and 2017, has seen Australia move up from 20th place in the previous 2012-16 report. Australia's number one client was the US, making up 51 per cent of Australia's major arms exports, followed by Indonesia at 28 per cent and Oman at 8.5 per cent. And while Australia moved up in the rankings for exports, it also moved up on the list for imports, going from 7th to 6th. Unsurprisingly, 61 per cent of Australia's major arms imports came from the US, followed by 26 per cent from Spain and 6.9 per cent from France. News of the move to 19th place comes just weeks after the federal government unveiled its Defence Export Strategy, which outlined its ambitions to become a top 10 major arms exporter. While Indonesia and Oman made up 36.5 per cent of Australia's defence exports, the government is looking to target the Five Eyes market under its Defence Export Strategy. "Our target markets for defence exports are countries like the United States, Canada, the UK, New Zealand in the first instance. They are our most prospective destinations, followed by Europe and then beyond that places like Asia and the Middle East," Defence Industry Minister Christopher Pyne said in January. The minister said that while Asian countries, including Japan and South Korea, were targets, the government is not looking to export to China anytime soon, despite ruling them out as a military threat. "We obviously don't see China as a military threat," he said, citing China's own ambitions to grow its domestic defence industry. "We would not at this stage be exploring military sales to China, that isn't a priority market. That isn’t a priority market and of course they have their own very sophisticated domestic military market, which is unlikely they would look to Australia. We are more focused on countries like Japan and South Korea, Malaysia, in the south-east Asian and Asian region." The new strategy will be given $20 million per year for its implementation, including $6.35 million to develop and implement strategic multi-year export campaigns, $3.2 million to enhance and expand the Global Supply Chain program, and an additional $4.1 million for grants to help build the capability of small and medium enterprises to compete internationally. A $3.8 billion Defence Export Facility will also be administered by Australia's export credit agency, Efic, an initiative the government said will help Australian companies get the finance they need to underpin the sales of their equipment overseas and provide Australian defence industry an opportunity to identify and pursue new export opportunities when there is a market gap for defence finance.